The first papal tweet. From an iPad no less. 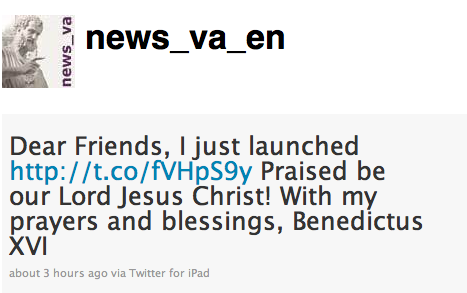 If you want to follow the latest Vatican news on twitter, just sign up for http://twitter.com/news_va_en. No word on if Benedictus XVI will be getting his own personal twitter account, although he clearly seemed to enjoy the novelty of being the first occupant of the Chair of Peter to address the world via twitter. For the record, the first Pope ever to be seen on film is my own beloved Pope Leo XIII (1810-1903) in 1896. He is also the first Pope of which we have an audio recording, praying the Ave Maria in Latin. And the first Pope to address the world via Vatican Radio was Pope Pius XI in 1931. In 1957 Pope Pius XII issued an encyclical on Motion Pictures, Radio and Television titled "Miranda Prorsus", which is Latin for “wonderful invention". Below are a few excerpts. Clearly, the new "wonderful inventions" of our times offer the same mixture of blessings and curses on society. What would Pius XII have to say about cable TV, video games, the internet, cellphones, computers and video players? These [inventions] particularly concern the mind – reach the mass of the people themselves, either directly or through the pictures and sounds they produce, and convey to them in a form easy to understand, the news, thoughts and usages of every nation, and by these means provide, as it were, food for the mind especially during the hours of rest and recreation. From the time when these arts first came into use, the Church welcomed them, not only with great joy, but also with a motherly care and watchfulness, having in mind to protect Her children from every danger, as they set out on this new path of progress. Just as very great advantages can arise from the wonderful advances which have been made in our day, in technical knowledge concerning Motion Pictures, Radio and Television, so too can very great dangers. For these new possessions and new instruments which are within almost everyone's grasp, introduce a most powerful influence into men's minds, both because they can flood them with light, raise them to nobility, adorn them with beauty, and because they can disfigure them by dimming their lustre, dishonour them by a process of corruption, and make them subject to uncontrolled passions, according as the subjects presented to the senses in these shows are praiseworthy or reprehensible. From the beginning of time, it has been man's natural and normal tendency to share with others the treasures of his mind by means of symbols whereby he daily tried to develop a more perfect means of expressing his material problems. Thus, from the drawings and inscriptions of the most ancient times down to the latest technical devices, all instruments of human communication inevitably have as their aim the lofty purpose of revealing men as in some way the assistants of God. Why do these same arts sometimes become the means, and, as it were, the paths leading to evil? ... It can be only from the fact that man, endowed as he is with free will, can abuse those gifts, namely, by committing and multiplying evil, and thus associating himself with God's enemy, the prince of darkness. In like manner, approval cannot be given to the false principles of those who assert and claim freedom to depict and propagate anything at all, even though there has been established beyond dispute in these past years both the kind and the extent of the damage to both bodies and souls which has had its source in these principles. There is no question here of the true liberty of which We have spoken above, but rather of an uncontrolled freedom, which disregards all precautions, of communicating with others anything at all, even though it be contrary to sound morals and can result in serious danger to souls. "Should we not shudder if we reflect attentively that by means of television shows, even within home surroundings all can inhale that poisoned air of "materialistic" doctrines which diffuse notions of empty pleasures and desires of all kinds, in the same way as they did over and over again in cinema halls?" But Television ... has a power and efficacy of its own. For, by the art of Television, it is possible for the spectators to grasp by the eye and the ear, events happening far away at the very moment at which they are taking place, and thus to be drawn on, as it were, to take an active part in them; and this sense of immediacy is increased very much by the home surroundings. Everyone knows well that, very often, children can avoid the transient attack of a disease outside their own home, but cannot escape it when it lurks within the home itself. It is wrong to introduce risk in any form into the sanctity of home surroundings; the Church, therefore, as her right and duty demand, has always striven with all her force to prevent these sacred portals suffering violence, under any pretext, from evil television shows. [Television] has already inflicted serious harm on individuals and on human society; the extent of this damage up to the present time can be gauged only with difficulty. It is essential ... to be on special guard against the danger which the young may perhaps fall into, if they are present at shows intended for grown-ups. With regard to similar performances which are put on in cinemas and theatres, in order to preserve the common good, appropriate precautions have been deliberately taken in almost all civilized countries, with the object of keeping young people away from immoral entertainments. But it is common knowledge that television - and with greater reason - needs the benefits and safeguards of alert vigilance. Prudence and watchful care are especially demanded of those who make use of television. Due moderation in its use, prudence in admitting the children to viewing according to their different ages. 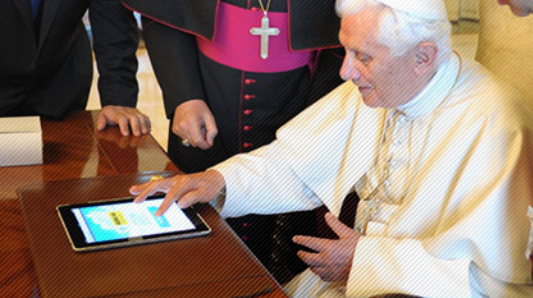 UPDATE: I added a video of the Pope issuing his first papal tweet. I wonder if one hundred years from now anyone will even remember what Twitter was? Will this bit of Vatican video take its place alongside the one of Pope Leo XIII that I highlighted above as a papal first? We have certainly come a long, long way technologically. But theologically, we seem to be going backwards. It seems that the more individual "freedom" we have, the more easily manipulated we are by the prince of darkness. And yet we still cling to our "freedom" and pseudo-democracy like false idols. As the popes have taught us since the beginning of the modern era (starting with Pope Leo XIII), true freedom is only found in Jesus Christ and the Church that He gave us. See "Pope Leo XIII on Freedom".